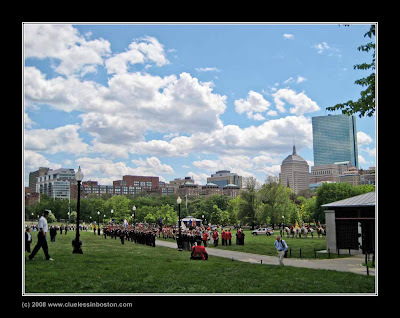 Monday afternoon on the Boston Common the Ancient and Honorable Artillery Company of Massachusetts conducted an exercise on the Boston Common. This company was chartered in 1638 and was the first chartered military organization in the Western Hemisphere. The Ancient and honorable Artillery Company serves as Honor Guard to the Governor of Massachusetts, who serves as its Commander in Chief. Unfortunately, their website « www.ahacsite.org » is password protected and cannot be accessed without authentication credentials. Perhaps they should add "secretive" to their "ancient & honorable" title. Great panorama of the Commons and the sky. Lovely, lovely shot! IT makes me want to sit and read outside.